Giving you endless options; we present to you our Stainless Steel Dining Set with Table + 8 Chairs, an incredibly versatile modern dining set. 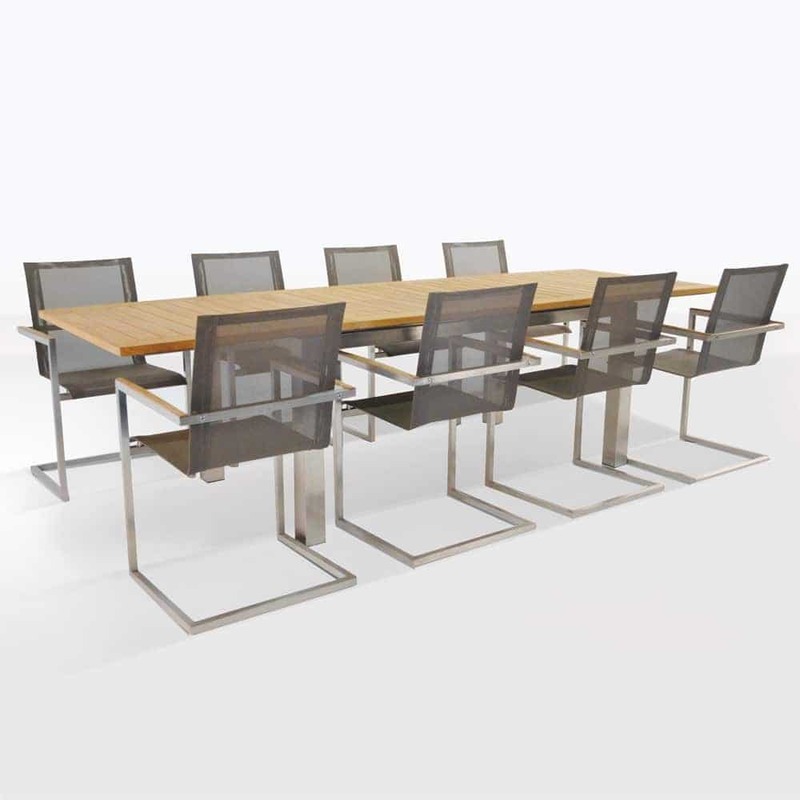 Sophisticated and luxurious; the Stainless Steel Dining Set with Table + 8 Chairs features one of our amazing Stainless Steel Extension Tables, beginning at an elegant 165cm by 90cm and extending to 285cm long, giving you great options for large lunch and dinner parties. Explore more sizes in our extension tables to suit your space. 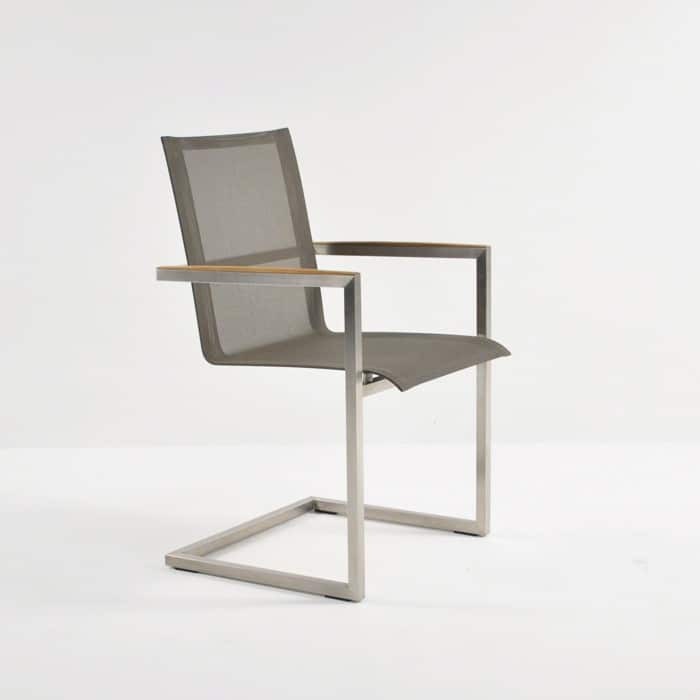 The Bruno Chairs, shown here in Taupe, are made from Batyline® mesh and #316 Stainless Steel with Grade A Teak. Choose from taupe, black or white mesh to suit your space. Giving you endless options; we present to you our Stainless Steel Dining Set with Table + 8 Chairs, an incredibly versatile modern dining set. Sophisticated and luxurious; the Stainless Steel Dining Set with Table + 8 Chairs features one of our amazing Stainless Steel Extension Tables, beginning at an elegant 165cm by 90cm and extending to 285cm long, giving you great options for large lunch and dinner parties. 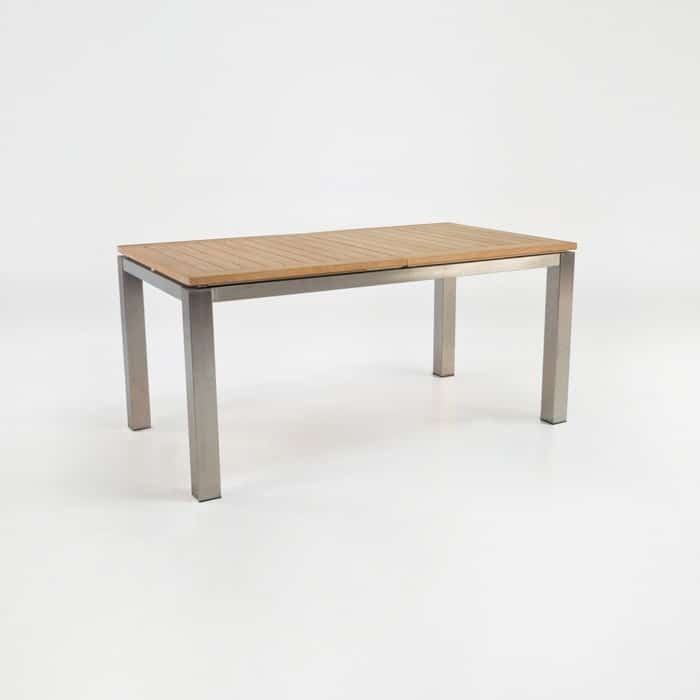 Explore more sizes in our extension tables to suit your space. The Bruno Chairs, shown here in Taupe, are made from Batyline® mesh and #316 Stainless Steel with Grade A Teak. Choose from taupe, black or white mesh to suit your space. The overall look is sleek and chic, while still accommodating large numbers or a more intimate group with the option of extending the table. This versatile modern dining set is the epitome of comfort and style. At Design Warehouse, we focus on using the best materials for our stylish and fashionable furniture. 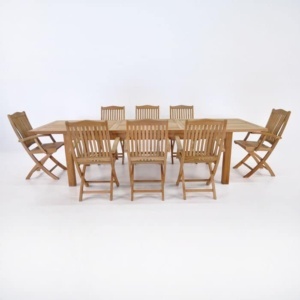 The Stainless Steel Dining Set with Table + 8 Chairs with its combination of teak, stainless steel and Batyline® mesh, you are guaranteed quality, here’s why: Grade A Teak is proven to be the best wood to use for outdoor furniture. Grown in a plantation in Java, Indonesia, the teak tree is aged 40 plus years, meaning the wood has had time to develop its own oil and rubber properties, thus making it strong enough to withstand harsh conditions. The stainless steel is all #316 marine grade, we had to make sure of this, as in ocean climates other products will rust, whereas ours won’t. It will continue to look beautiful for years to come, with low maintenance. Finally, we are extremely proud to have a great range of products that feature the stylish, European Batyline® mesh. Developed by car companies and used on super yachts all over the world, we know this product is superb; long lasting, deliciously comfortable and exquisite. Do you have a large extended family but don’t want a huge table set up all year round? 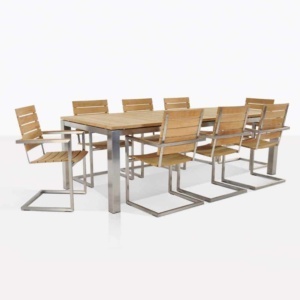 The Stainless Steel Dining Set with Table + 8 Chairs will solve all your problems, being extendable it gives you the options for hosting a modest or a big group, without compromising on style. Perhaps you prefer a bench? 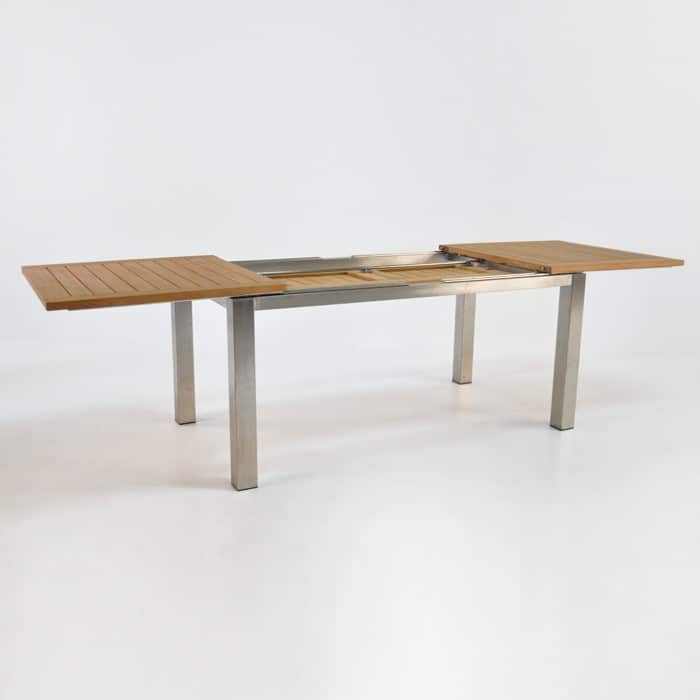 Peruse our range of teak, stainless steel and concrete benches for ideas in mix and matching. Our sales consultants can help you in creating a story that suits the dimensions and character of your space, so call us now! Design Warehouse is open 7 days a week for just that reason, we want to be on call for our customers. Ready to help you find something that realises all your desires! The Stainless Steel Dining Set with Table + 8 Chairs is in store now – items are sold separately, so you can mix and match to your hearts content!